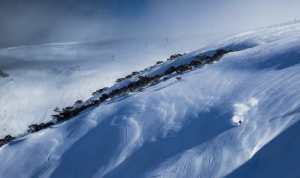 The Sky Piercer – award winning film about skiing NZ’s Mount Cook screening in Sydney and Melbourne next week. We’ve got two double passes to each premiere to giveaway. Find out more below. 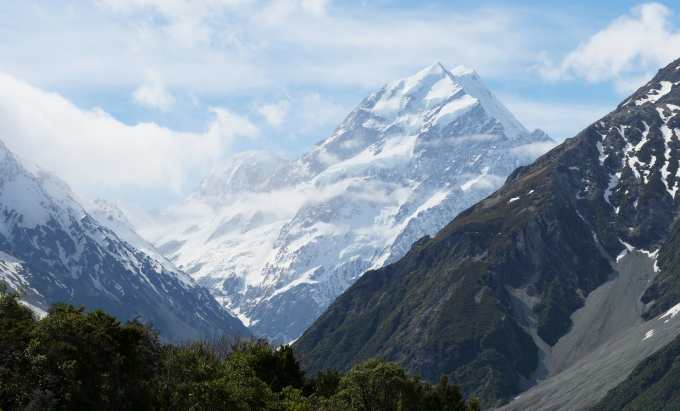 At 3,724 metres, Aoraki / Mount Cook is half the size of famed 8000 metre peaks in the Himalayan and Karakoram ranges, but what Aoraki lacks in size, is made up for in technical difficulty, heavy glaciation and severe, ever-changing weather. 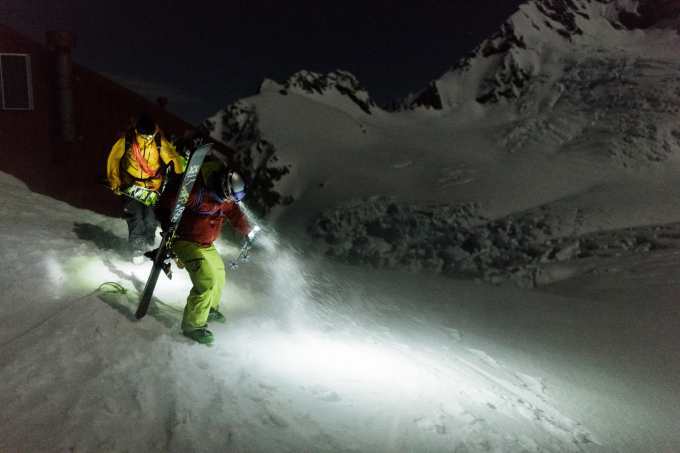 It is a trial to be tested only by experienced mountaineers when weather allows. 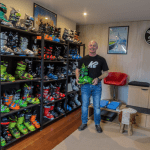 For Kiwi Big Mountain skier Sam Smoothy, his desire to climb Aoraki was nurtured from hearing his parents’ stories about their experiences on the mountain. 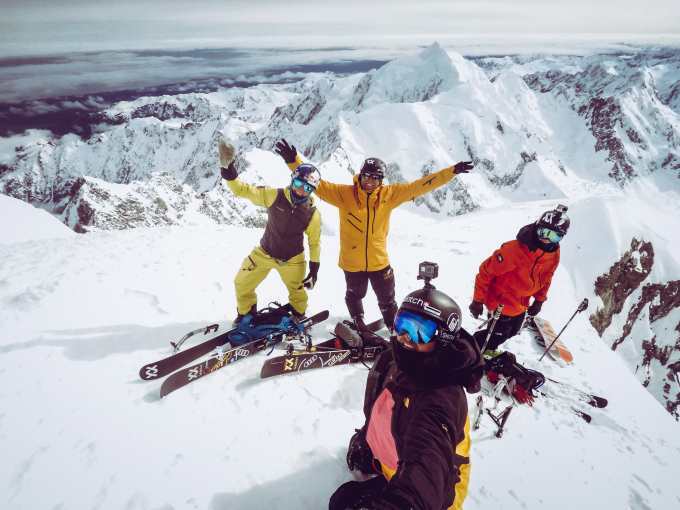 In the film, Sam and fellow pro skiers, Nadine Wallner, Fraser McDougall and snowboarder Xavier De Le Rue set out to ascend and ski the East Face of Aoraki/Mt. Cook. 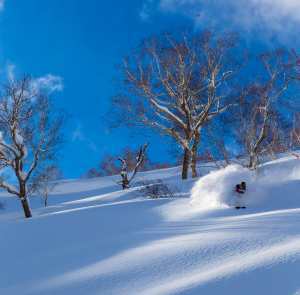 The Sky Piercer, a CoLab Creative film, is a homage to the country he loves, and its highest mountain. 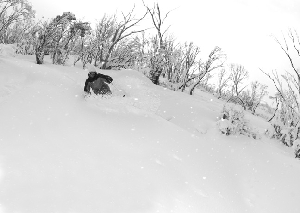 Below, Sam Smoothy talks about the film and Aoraki’s significance to him as a skier and a New Zealander. In what year did you parents climb Mount Cook? What was their experience like on the mountain? My parents Ron and Ellen climbed Zurbriggens Ridge, beside our ascent route, in 1976, then the standard Linda route in 1977 and then in a huge nudge pulled off a Grand Traverse, a complete traverse of the entire summit ridge of Aoraki/Mt Cook in 1978. Sir Tipene O’Regan, who features in the film, mentioned the Maori importance of a person’s home and connection to their land – saying the first question they would ask a person is not, ‘What is your name?’ but ‘Where are you from?’ What was the significance to you of hosting athletes in your home country, showcasing the unique climate and versatile adventure playground that New Zealand offers? This aspect of the trip was huge to me. I have spent so much of my life overseas and really do value my homeland so much. To be able to share that passion for the mountains and coastline of my home with some of my best friends from Europe was very special. Showing them how I like to live, basing my location and activities of what is best suitable to the weather, really gave them a great understanding of why I rate home so highly. Sir Tipenes line about being shaped by land and not shaping it really resonates with me and I really think I am a product of my environment and the people who I love going on adventures there. If climbing and skiing Mount Cook has been your long-time dream, what was the catalyst that got you going for it at this time? How did you approach your training for it? I just felt it was time, I felt my skills had got to a level where I was happy to challenge Aoraki, felt I’d put in enough time in big mountains climbing and skiing. Training, outside of my normal regime, just involved more walking. Up hills, with skis on, sometimes going skiing but really just trying to change from a body built for high impact competition build to a more backcountry travel, lean and mean style. It is a long and technical ascent. Once you had set yourself the goal, how did you go about choosing the right team to make the climb and descent with you? The team was pretty easy to assemble hey. The emphasis for me being strength and smarts in the big mountain terrain, but also a fun-loving nature to be able to enjoy all the extra activities and road trip vibe that I knew would make up a lot of trip. Fraser had to be involved as my ski/adventure partner, I couldn’t really imagine doing Aoraki without him. Xavier and Nadine were also natural selections, both being really strong but also safety conscious and I’m just so grateful they wanted to be involved as they brought so much to the table. With this being a career highlight for you, do you have anything on your radar now that would match this? This was a huge milestone for me and the culmination of so many years of learning in the mountains but it’s also a stepping stone to bigger lines and mountains. If anything, it’s increased my admiration for Aoraki and I’d love to ski a few different lines there for sure. The amazing thing about NZ mountains is due to the wild weather and nasty access there are so many areas for me to explore that I have so many more adventure ideas than I could ever hope to get done in a lifetime. Sky Piercer is screening in Sydney at the Chavuel Cinema in Paddington on November and Melbourne at the Nova Cinema in Carlton on November 29. Hit the below links to purchase tickets. We’ve also got 2 double passes to give away to each premiere! Enter via our Facebook and Instagram to go in the draw! 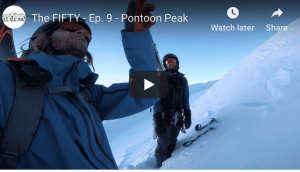 Pontoon Peak is a huge, steep, exposed mountain in Alaska’s Chugach Range and regarded as one of “prizes” of big mountain skiing. It’s essential that you go and see a credible bootfitter to make sure that you’re getting your foot into a boot that’s designed for you.